Implications of our theoretical view to human political psychology and public policy. Talk by Paul and Joanne at the Spring 2011 Society for American Archaeology meetings in Sacramento, California. This talk reviews the archaeology of coercive technology in native North America and its relationship to the evolution of social complexity and revolutionary social change. As discussed in Chapter 12 of Death from a Distance, North American archaeology is one of the richest and most important sources of data to test any theory of history and our theory is extremely powerful in the predictions it makes about what should be found by archaeologists. The authors of Death from a Distance present a 35 minute public lecture summarizing their research on human evolution and behavior including implications for interpreting our history and our current social, political, and economic conditions. See it now on YouTube! The authors of Death from a Distance are holding a talk at Hofstra University's IDEAS Science Evening on Thursday, September 23rd, 2010 from 7:30pm to 9:00pm. This free and public event will be held at Monroe Lecture Center on California Avenue in the South Campus. More information is available on Hoftra's website. Radio Interview on "New Books In History"
Listen to our Radio Interview on "New Books In History" with Marshall Poe of the National History Center. We discuss our theory of history. Listen to it here: http://newbooksinhistory.com/?p=2361. Update: Also see the lively new online discussions below the post. The authors of Death from a Distance are giving a talk on human history and political behavior with rich new insights from evolutionary biology. The event will be on Wednesday, April 14th 2010 from 12:50pm to 2:10pm (during campus lifetime) at the Social and Behavioral Sciences Building, Room N-320. The authors of Death from a Distance are holding a lecture and book signing event at the Wang Center at Stony Brook University. Meet the authors, get your book signed, and begin your journey into the history of the human race. The event will be on Monday, March 15th 2010 at 7:30pm in Lecture Hall 1. This event is sponsored by the Undergraduate College of Human Development. The authors of Death from a Distance are holding a book presentation and signing event at the Stony Brook University Bookstore. Meet the authors, get your book signed, and begin your journey into the history of the human race. Light refreshments will be served. Students, faculty, and staff are all welcome. The event will be on Wednesday, March 10th 2010 from 1:00pm to 2:00pm (during campus lifetime). The authors of Death from a Distance are giving a talk at Stony Brook University Medical Center Grand Rounds, Pathology. The event is free and open to everyone. science, medicine and the human future. Obama's Nobel Peace Prize address is a remarkable historical document and relates to Chapter's 16 and 17. To join a discussion or make comments on this issue, go to our Facebook page Death from a Distance and the Birth of a Humane Universe. Six detailed student testimials have been added to the Courses page. There are two new videos on the site. In the Chapters Overview Video, the authors provide an glimpse of the journey through the 17 chapters of the book. In the Author Biographies Video, they present their respective histories that led them to uncover the keys to human uniqueness. 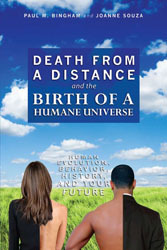 Death from a Distance and the Birth of a Humane Universe is now officially available on Amazon.com! Todd Rothman - Chief Consultant on this project. Karen & Steven Eason from Streaming Tutors for their past and current support. Henry Wang for his creative insight and design. Arnav Shah for his hard work in building this website and assisting in the design. Tia Mansouri for her creative ideas in the banner. The intellectual, technical, and artistic expertise of all helped to bring this collaborative effort to a new level! A fully online new graduate course based on this new theory of human uniqueness is now available! See the Courses section for more information. The authors are producing a 24-part series of broadcast-quality lecture videos this Fall. They are collaborating with world-famous producer/director Dini Diskin Zimmerman and her outstanding crew in the Stony Brook University TV studio. The team is producing the next generation of assets supporting our state-of-the-art digital/video-based global online course. Become a fan of the book on Facebook. Also check out media, learn about events, and converse with other fans. Stay up to date with all the happenings of Death from a Distance. Our handle is humanefuture. This wide-ranging and provocative book is overflowing with ideas and insights into what it means to be human as well as how and why we came to be the way we are. Not a typical book on human evolution; it is, to use the authors' phrase, "a theory of everything."